Fishery ecosystem planning requires the participation of communities. Careful, planned decision-making is necessary to ensure that growth and development is consistent with the long-range goals of the community. The American Samoa Archipelago Fishery Ecosystem Plan (FEP) fosters increased collaboration with communities and the public as well as with domestic and international management bodies and government and non-governmental organizations. The decision-making structure for the FEP utilizes a bottom-up approach, which begins with the solicitation of recommendations from the FEP Advisory Panel, the American Samoa Regional Ecosystem Advisory Committee, the Council’s Indigenous Programs and the Archipelagic FEP Plan Team. These recommendations are then reviewed by the Scientific and Statistical Committee and the American Samoa FEP Standing Committee prior to decision-making by the members of the Western Pacific Regional Fishery Management Council. Final recommendations by the Council are transmitted the Secretary of Commerce for approval. Additionally, international management and research are promoted through the development and implementation of agreements regarding marine resources. The FEP Advisory Panel provides input on fishery manage­ment issues and planning efforts and the content and likely effect of management plans, amendments and management measures. Eight members form the American Samoa subpanel, with two each representing the territory’s commercial, recreational and subsistence fisheries and ecosystems. The American Samoa Archipelago Regional Ecosystem Advisory Committee includes Council members and representatives from federal, state and local government agencies; business­es; and non-governmental organizations with responsibility and interest in land-based and non-fishing activities that potentially affect the area’s marine environment. 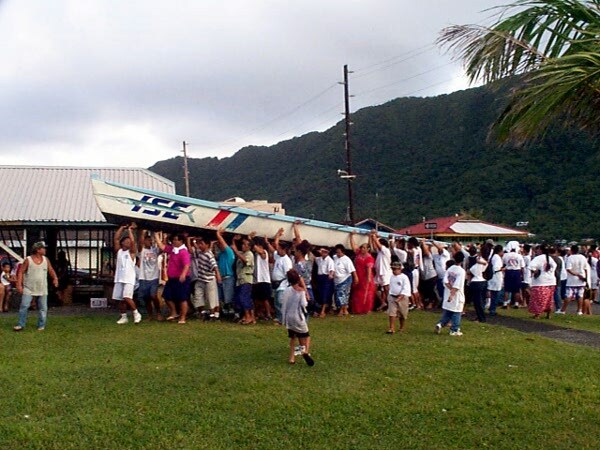 Current members include the American Samoa Departments of Marine and Wildlife Resources (DMWR), Commerce, Public Works, Agriculture, Health, and Parks and Recreation; Office of Samoan Affairs; Environmental Protection Agency; American Samoa Community College’s Marine Science, Land Grant and Sea Grant Programs; Coral Reef Advisory Group; Coalition of Reef Lovers; Alofa Lures and Longline Service; Small Business Construction Initiative; the National Marine Fisheries Service; National Weather Service; National Marine Sanctuary Program; National Park Service; and US Coast Guard. The Council’s Indigenous Programs address the economic and social impacts of colonization, militarization and immi­gration on the people in the Council’s area of responsibility and authority. It includes the Western Pacific Community Development Program and Western Pacific Community Demonstration Project Program and Advisory Panel. Vaasa Taamu and Maopu Sambo Mageo currently represent American Samoa on the Panel. The Archipelagic FEP Plan Team oversees the ongoing development and implementation of the four insular FEPs for the Western Pacific Region. It monitors fisheries performance and fish stocks managed under these FEPs. Currently, American Samoa is represented on the Plan Team by Doug Fenner and Nonu Tuisamoa from the American Samoa DMWR. The Science and Statistical Committee identifies scientific resources required to develop the FEPs and amendments, recommends resources for the Plan Teams, provides multidisciplinary review of management plans and amendments, evaluates scientific information, and advises the Council on the composition of the Plan Teams. American Samoa is represented by Benjamin Carroll from the American Samoa DMWR. The American Samoa FEP Standing Committee reviews all relevant information and data including recommendations from the Advisory Panel, Plan Team and SSC and provides recom­mendations to the Council. American Samoa is represented on the Standing Committee by William Sword (Chair), Michael Brown, Ruth Matagi-Tofiga and Claire Poumele.